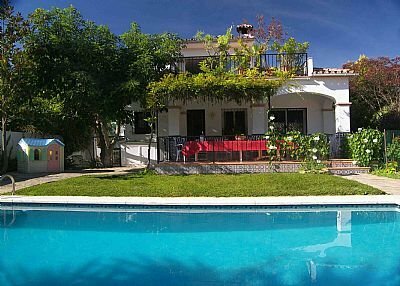 Private, fully air-conditioned villa with own pool and garden apartment in quiet cul-de-sac close to Puerto Banus. The large mature gardens (900sq m) are private and enclosed, with sun all day and a shady patio area under the trees for outdoor meals. Well equipped built-in barbeque. There is a splendid upstairs terrace off the master bedroom with panoramic views over the pool, mountains and sunrise. The ground floor terrace is shaded by a leafy pergola. There is off road parking for 2 vehicles, and an electronic entrance gate. The pool is 8x4m. There is also a barbeque area. Perfect for families, golfers or those seeking a quiet retreat. This property also offers wireless broadband internet access and table tennis. Casa Salamandra is ideally situated 500m (5min walk) to shops, restaurants and supermarkets, 1,2 km (15min walk) to Puerto Banus for night-life and the beach, and at the entrance to the Golf Valley. Despite being so close to all the amenities, its location at the end of a residential cul-de-sac provides tranquility and security. The property is fully air-conditioned and offers wireless internet access. channels. Insect repellents are provided in each bedroom and there are travel adaptors available for UK electrical appliances.